What is a Giclée Print? 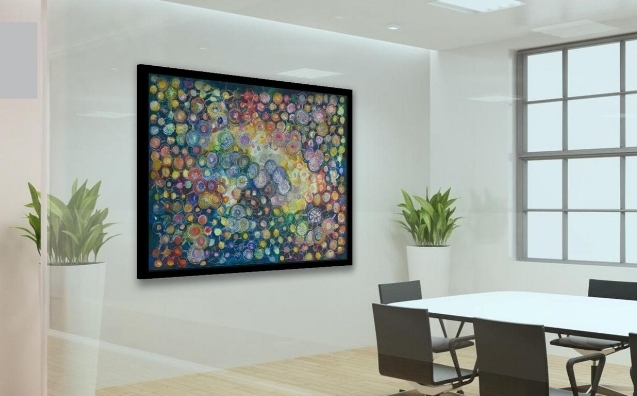 Truly works of art in their own right, Giclée are fine-art print reproductions of original work found in galleries and private collections throughout the world. Printed in Limited Editions of 50 per image and size, original work is made available in giclee print format on museum quality paper with archival ink and hand embellished by the artist. The result is spectacular. Rows Upon Rows of Purls, The Quilting Series 2009; Giclée Reproduction 54" x 40"
Giclée prints are high-quality reproductions of original artwork created with archival pigment on museum quality paper and hand embellished by the artist. Truly works of art in their own right, Giclee printing is a new medium for artists and collectors. Giclée prints are in museum, gallery and private collections throughout the world. Original work is digitally scanned to make master files between 500 to 1200 MB. The reproductions capture brush stroke and fine detail as well as the weave in canvas and watermarks in paper. The musician Graham Nash, who is also an accomplished photographer, funded the original technology. In 1991 the name Giclée was created because fine art collectors preferred terms that did not include “digital” and “computer”. Today Giclée describes a high quality, digitally produced, fine art print. Giclée pieces are available in sizes proportional to the original. Signed and numbered personally by the artist, the magic of original artwork is captured and delivered rolled and ready for you to frame.